Remember when phones looked like this? Alfie and I were just talking the other day about how we have to stop saying "Dial a number", because we're totally dating ourselves! It's incredible to think that our kids have NO idea what rotary phones are (actually, they have no idea what a "corded" phone is since all the phones they've seen are cordless!). 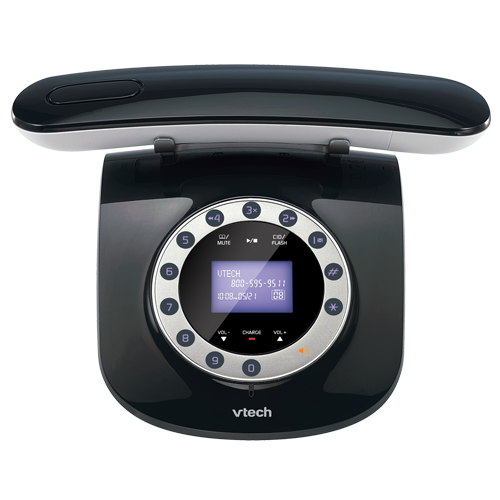 So when VTech phones told me about their retro (sort of) cordless phone, I had to feature it here. Okay, the design is kind of space age, and you punch in rather than dial the numbers, but it still brings back memories of busy signals and party lines.